Marijuana, otherwise known as mary jane, ganja, or… well, weed, has been a huge topic of discussion over the past few years. Many people want it legalized, while others think it should be a criminal offense. As time has passed, some states have approved it for medical and/or recreational use. Have you ever wondered what it would be like to grow and sell weed yourself without any real life consequences? 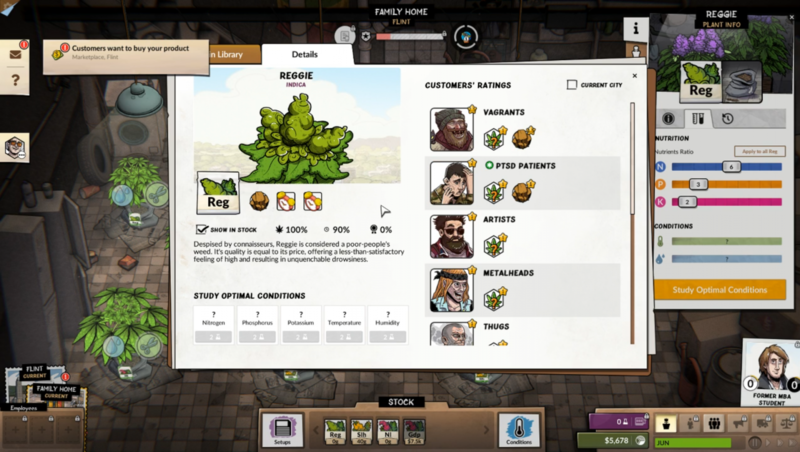 Weedcraft Inc. lets you do just that and experience what it might be like to start a “truly green” business. 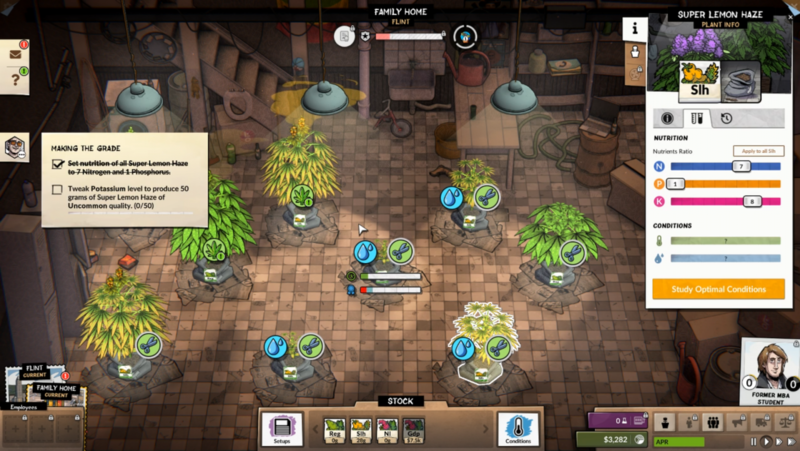 Weedcraft Inc. is a tycoon game that revolves around growing and selling weed. There are two different scenarios that you can choose from, which denotes the difficulty. You’re better off picking the easy one at first, and it follows a guy who comes home after his father passed. His brother tells him about their father’s financial and health problems, which prompts the discussion of money. The two decide to start up a weed business together, and this is where the journey begins. You’ll start small with poor soil to grow plants, a lame starter strain of weed, and access to a very low-end ceiling light. This, along with plenty of simple tasks and tips, are all designed to help you get the hang of how to play. It’s very linear, but it does help you get a better handle on the gameplay. As you play, you’ll slowly unlock access to better soils, more strains of weed, better lighting, and other helpful tools. Better tools cost more money, but they help increase the quality of your product, so they’re worth it. Now, just because some tools improve your product’s quality doesn’t mean there aren’t going to be negative effects. Better soil may create a stronger smell, which can make the police more suspicious, or better lighting can raise the temperature too much and hurt plant growth or even slowly increase electrical costs to a suspicious level. One instance of these won’t be enough to cause problems, but as you add more, you take on more risk. The upside is that there are things that can help with smell and temperature like fans and air purifiers. This adds more challenge since you can’t just buy all the best things and assume you’ll be perfectly fine. The grow room is the most important location; this is where you’ll need planting, watering, and training your plants. Frequent watering is needed to keep them healthy and training causes them to mature faster. Each plant has a symbol for both of these on it and they’ll light up when you can perform said action. Watering only requires a button press, while training requires you to hold down the left mouse button for a short time. The grow room only starts with three pots, but you can purchase more space if you make enough money. Each extra room adds three more spaces that can be filled with plants or equipment. You’ll be tempted to focus purely on plants, but as mentioned earlier, you’ll need to take into account equipment that can help reduce damage to plants or reduce suspicion. If you want to grow a successful business, you won’t be able to maintain it all by yourself. Once you get far enough, you’ll be able to hire employees. These employees can help you grow and sell your product. Each employee has stats that show you how experienced they are at growing and/or selling weed. These should be taken into account when deciding what you want help with. After someone is hired, you can assign them up to two tasks. Once assigned, they’ll focus on reducing your workload for those tasks. They may not be as helpful as doing things yourself, but you take what you can get. If you are concerned about loyalty, you can talk to them in order to strengthen your relationship. This can be done with rival dealers as well, which is helpful. If you get close enough, you can even ask for favors like receiving a special strain of weed, shutting down their operations in a certain spot, and more. The relationship aspect of the game is extremely bland, simplistic, and boring, but it has useful effects. You’re not going to care about anything revealed in conversations, and anything important is pointed out to you at the end anyways. As with all tycoon games, you can lose easily because of poor decisions. The main ways to fail are from bankruptcy or getting arrested. Bankruptcy is avoided by carefully managing your money, resources, and other aspects of your business, while jail is avoided by not getting caught or finding a way to have the police cut you some slack. Both methods take a lot of planning and effort, so be ready to think strategically. 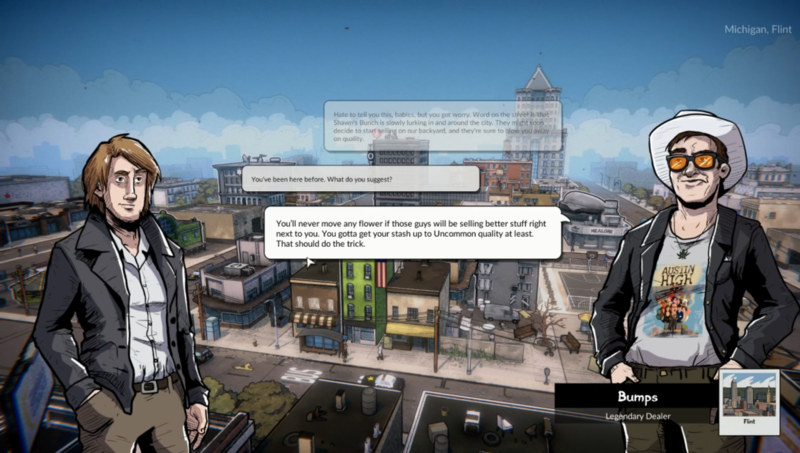 The design of the game itself matches the game’s premise very well. The colorful aesthetic is pleasing to look at, while the soundtrack is hit or miss (similar to how people feel about weed itself). It sounds like something that you would stereotypically imagine a stoner be listening to while smoking. I land in the middle ground and didn’t really mind the music that much. The gameplay is easy to learn but takes some time to get used to. If you’re used to point and click or tycoon games, you’ll feel right at home. Even so, the topic of the game is what may be the breaking point for some people. 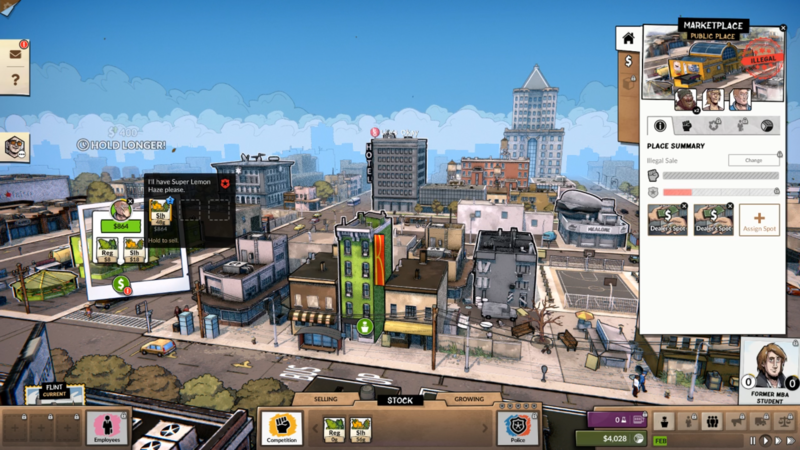 That being said, even if it isn’t perfect, Weedcraft Inc. is an interesting tycoon game that is worth a shot if you’re interested in the weed business in any way.